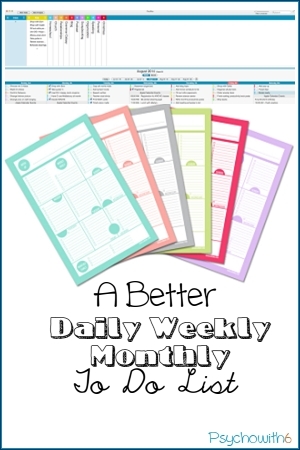 One of my most popular posts is Can a Daily Weekly Monthly To Do List Help You Get More Done? Many people are looking for a to-do list that keeps their monthly and weekly goals in sight. There was just one problem with the form I linked to in my post: I didn’t like it. I needed more room for my goals. So I embarked on a search! And I believe I have found two great options–one paper and one digital. Before I tell you about them, I want to explain that a daily, weekly, monthly to-do list has made a world of difference in my weekly reviews. David Allen and many other productivity experts recommend a time of reviewing the past week and planning for the upcoming one. It’s advice that just makes sense. The problem is I wasn’t doing it. It seemed so dreary and time-consuming to look over all my tasks. Goals, on the other hand, are what I get excited about. If I can review my tasks for the purpose of setting weekly goals, the review doesn’t feel like drudgery. Then if you give me a beautiful form on which to record said goals, I’m in business! I found a beautiful free form available in teal from Jana Laurene. 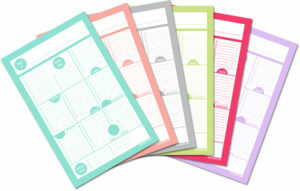 But I paid a few dollars to get the forms in a number of different colors. I printed mine in gray so it wouldn’t look obnoxious on my refrigerator. I wanted it there as a constant reminder for me and also so my family could see what I was up to. The forms are two to a page, but I felt I didn’t have enough room to write that way, so I expanded mine to a full 8.5×11 in Word. When completing the form, I found it helpful to note my appointments on various days, too. It’s much easier to plan a doable task load that way. I found out about DayMap for iOS on Mark Forster’s forum. I watched the video explaining the rationale behind DayMap and loved the plain-spoken developer’s story. Then I downloaded the free version of DayMap to my Mac and HELLO! It was exactly what I’d been looking for and I didn’t even know it. (That’s kind of how it was when I met my husband, too, but I digress…). Here’s how I use DayMap as my daily, weekly, monthly to-do list. I listed all the main areas of my life across the top using the same titles and colors as I use in ToDoist. I chose any tasks listed under each life area in ToDoist that I wanted to accomplish this month and added them to DayMap. I upgraded to DayMap from DayMap Lite so that I could pull in Apple Calendar (which is synced to my Google calendar). That allowed me to see my commitments so I could plan my tasks accordingly. I pulled monthly task goals from the upper life area to the day I wanted to achieve them. There isn’t a weekly goal section per se, but seeing the entire week at a time gives me the same effect. It’s big and it’s beautiful. What’s more is there is a syncing iPhone app, so I can check tasks off as I go. And unlike paper, it’s easy to move tasks to a different day. I do this if I have a goal that requires daily work. I don’t check it off, but move it to do the next day as well. Planned tasks are italicized in the area list above. Completed tasks are crossed out. It’s very possible to use DayMap as your only to-do list. But because I have so many email-associated tasks and one-offs, I will continue to use ToDoist as my catch-all list and DayMap for planning and goals. My apologies to those without Macs, because I love this app! However, I have found that my readers prefer paper. So check out Jana’s to-do list and give it a whirl! What do you think? Have you come across a daily, weekly, monthly to-do list that you like better than these?